Mazinkaiser GX-75 in his standard OVA form! A welcome addition to the Soul of Chogokin series. 8-inch tall figure comes with a huge number of accessories! 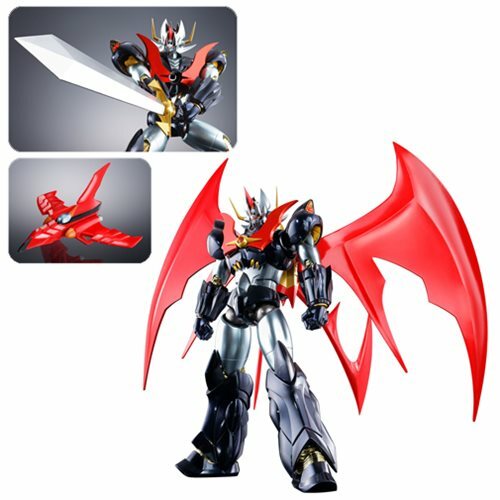 The Mazinkaiser GX-75 Soul of Chogokin Action Figure joins the Soul of Chogokin series in his standard OVA form. This approximately 8-inch tall figure comes with a huge number of accessories, including the Kaizer Scrander, optional wings for the Kaizer Scrander, three optional pairs of hands (L/R), mechanical face parts, Kaizer Pilder, two Kaizer Blades, Kaizer Blade deployment scene parts, a stand, two stand arms, Kaizer Scrander attachment parts for the stand, a Kaizer Scrander attachment, an optional chest emblem, and other optional weapons!